If you use a header or footer, you might not want it to show up on the first page. You might also want to remove headers and footers from other pages, such as the first page of new chapters or sections. Double-click the header or footer area (near the top or bottom of the page) to open the Header & Footer tab. Click the Different First Page box. This automatically removes any header and footer from the first page. 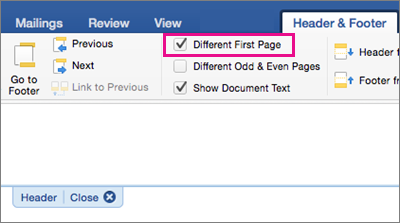 To remove headers and footers from individual pages within a document, start by inserting a section break. Important: Section breaks are different from page breaks. If you already have a page break before the page where you want to remove the header or footer, remove a page break and replace it with a section break as shown below. Click where you want to start a new page without the header or footer. Click Layout > Breaks > Next Page to create a section break. Click Link to Previous to turn off the link between the sections. 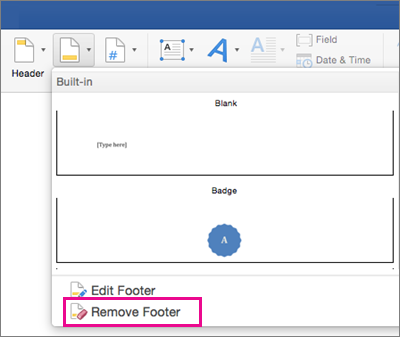 To return to the body of your document, click Close Header and Footer. Tip: You can also double-click anywhere outside the header and footer area to get back to the body of your document. The header and/or footer is removed from the first page after the section break. To remove all headers or footers after the section break, double-click in the header or footer area on the page where you want to remove the header or footer, and then repeat steps 4-6 above. If the section has different odd and even pages, you may need to repeat this. If you’d like to add headers or footers back later, insert another section break, and then add a header or footer to the new section.